Recumbents by National Bicycle Greenway : EBBC Vice Prez Powers West Coast Greenway on Early '90's Counterpoint Presto! EBBC Vice Prez Powers West Coast Greenway on Early '90's Counterpoint Presto! Tom Ayres, whose bio as VP for the East Bay Bike Coalition I have attached below, emailed me to let us know he just arrived in San Diego on his bike ride from San Jose! In his 60's he did it on a Counterpoint Presto recumbent bike at an average of 80 miles a day! Nationally sought for his expertise as a human factors consultant, he needed to be in San Diego for a conference, so he rode the 650 mile distance on a once cutting-edge machine that can still perform! And he did it on the West Coast Greenway that we are fine tuning per what you can find HERE. What's more is that Tom is considering helping us do our inaugural Mayors' Ride run from Seattle and/or Portland to San Francisco on it this next May..
Tom Ayres is a bicycle safety instructor who relies heavily on his bicycles for both utility and recreation. Formerly a member of the board of the Silicon Valley Bicycle Coalition, he now lives in Kensington, and represents Contra Costa County on the board of the Bay Area Bicycle Coalition. 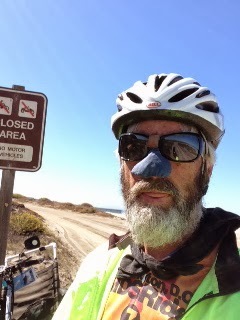 He volunteers on the annual AIDS Lifecycle rides, including as a training ride leader, and has made the 550 mile ride on his cwb recumbent. Tom has a PhD in experimental psychology and has worked as a human factors consultant since he left teaching. He is especially interested in research to evaluate the effectiveness of safety programs such as bicycle education classes.